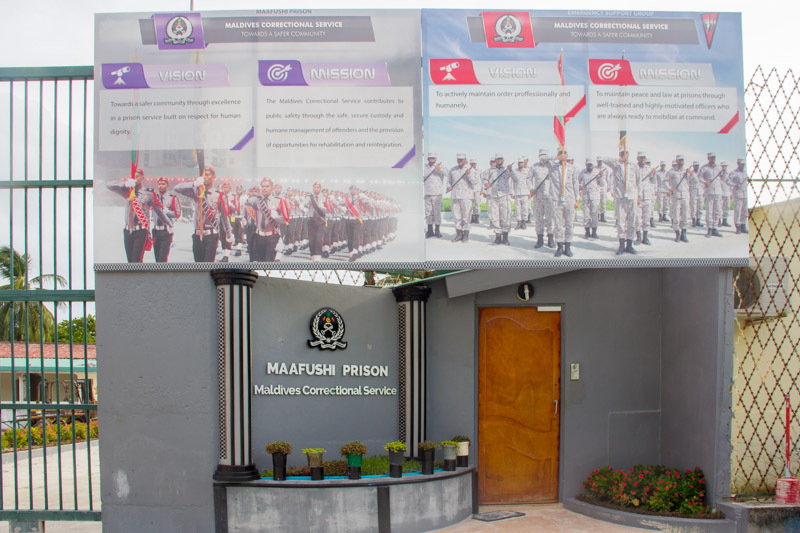 After months and months of contemplation, I decided that I should give Maafushi a try. 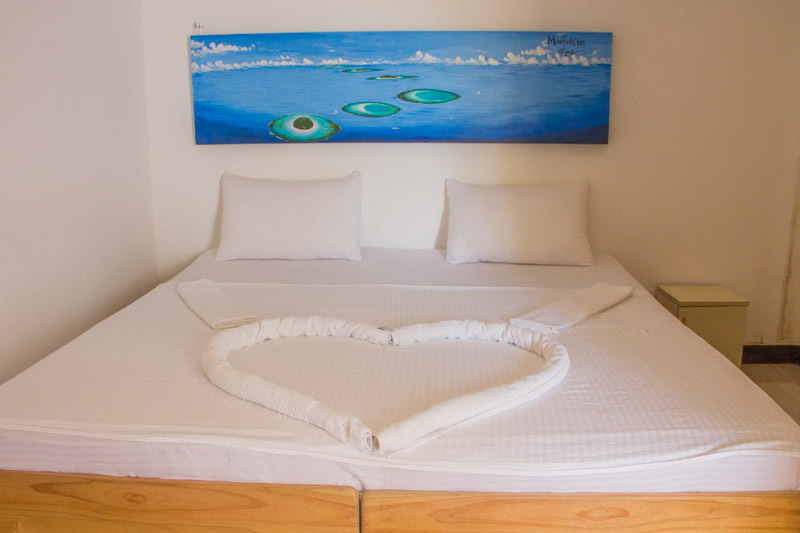 I booked 2 nights at Maafushi Inn as they have great reviews. We paid USD 54.2/room per night. From Malé, we took public ferry from Villingili Ferry Terminal. The journey took 1.5 hours. Below is the ferry schedule. 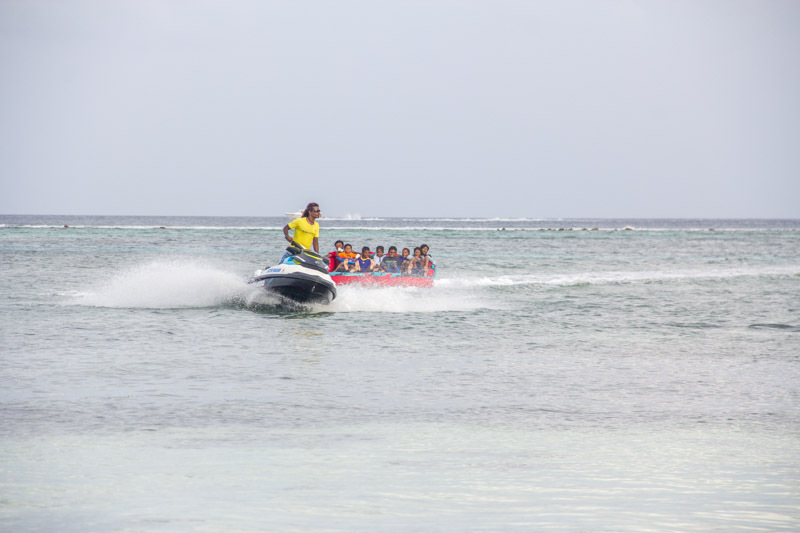 Another method of getting from Malé to Maafushi is the speedboat, which can be arranged with your hotel or with iCom Tours. 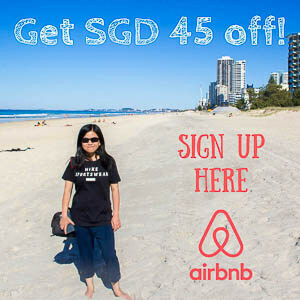 It costs about USD 20 – 40 per person, depending on the timing and provider. 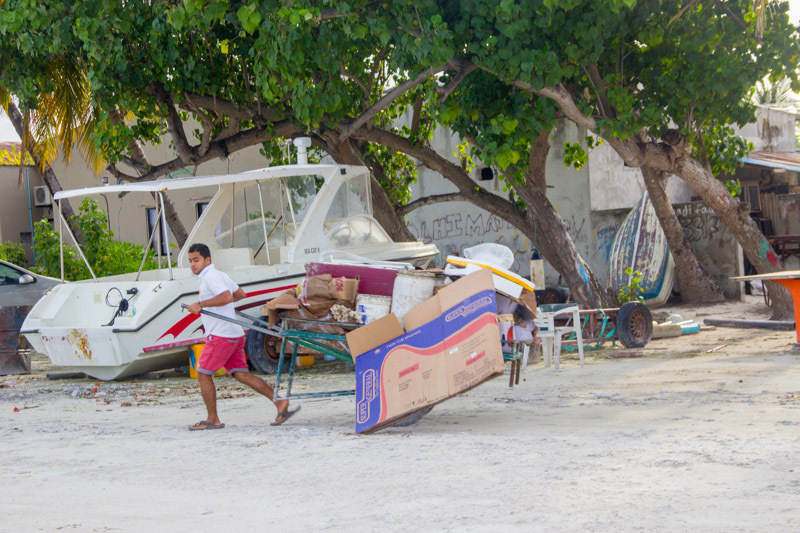 Pickup can be from airport or Malé. After we came down from the boat, someone approached us and asked for our hotel’s name. 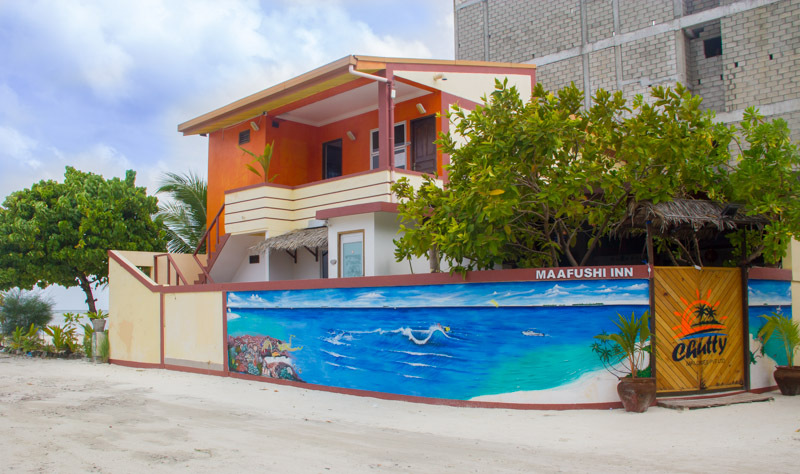 We said Maafushi Inn, and it turned out, that guy is a staff from the inn. He then loaded our baggage to a wheelbarrow and pushed it to the inn. At the check-in, we were met with a friendly and resourceful front desk guy who, we later figured out, is the owner of the inn. He upgraded one of our rooms to a family room at the second storey, woohoo! 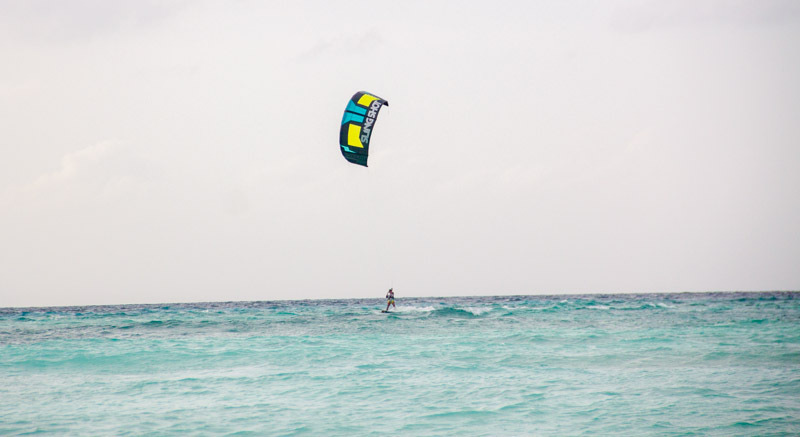 Maafushi Inn offers plenty of activities, they even have wetsuits hanging at the dining area. 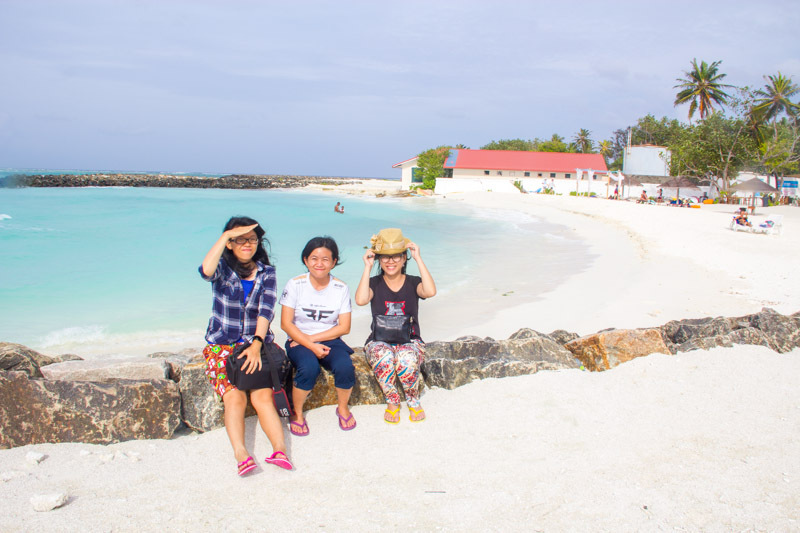 We ended up booking a day trip to Olhuveli through him. Spoiler alert: the trip was amazing! The rooms were spacious. They came with air conditioner and hot water. The mattress is kind of thin. It wasn’t mind-blowing, but it was affordable and comfortable. 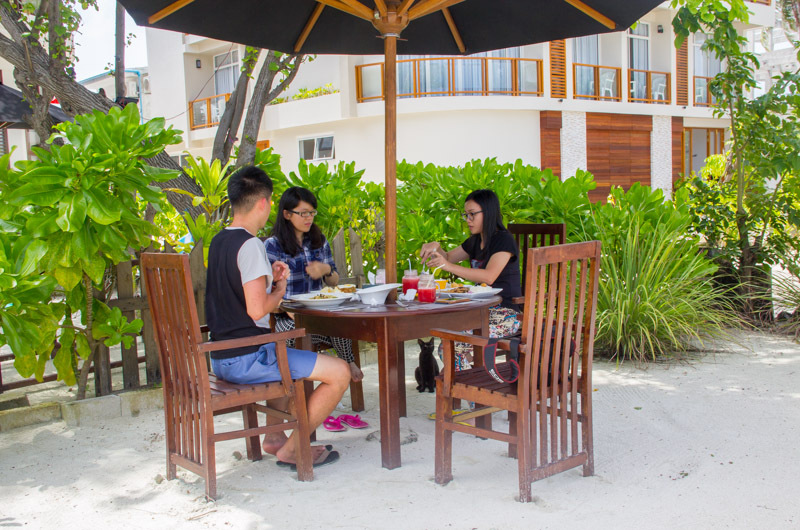 Our rooms came with breakfast, and it was the BEST breakfast we’ve ever had in our entire Maldives trip. It wasn’t sophisticated, but it was definitely well-thought out. They serve breakfast in buffet style. We got to toast the bread ourselves and make our own coffee or tea. 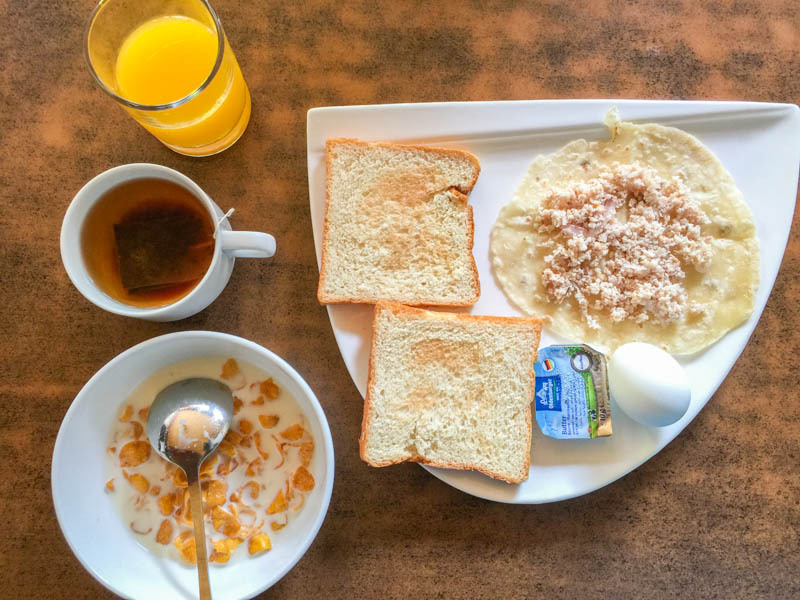 There were jam, butter, juice, water, eggs, milk, cereal and even Maldivian tuna breakfast! After 4 days of eating toast with jam and butter for breakfast in Hulhumalé and Hangnaameedhoo, Maafushi Inn’s breakfast totally won our hearts. 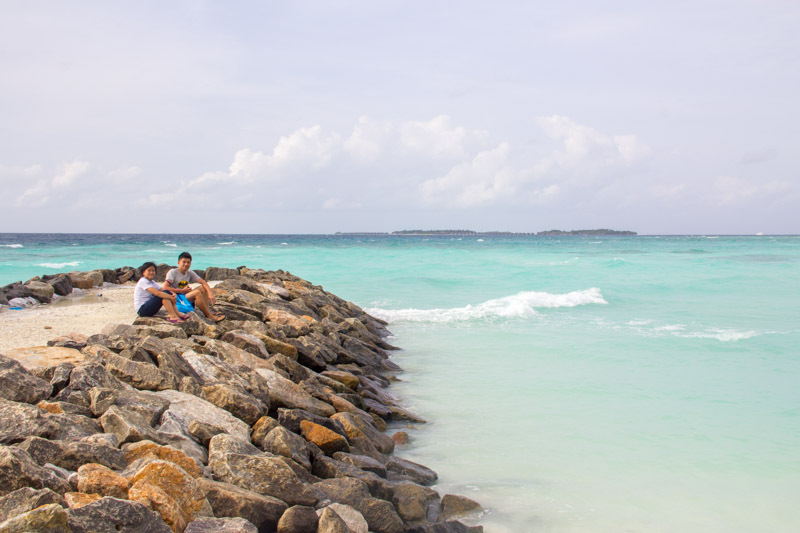 Contrary to the sleepy island of Hangnaameedhoo, Maafushi is so full of life. Everywhere we walked to, we saw other tourists. Most of the tourists don’t really adhere to the conservative clothing rule. Pants or skirts above knees are common. 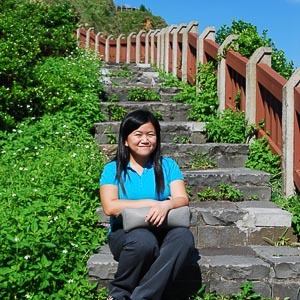 There are so many activity providers, so many hotels from guesthouses to fancy-looking hotels. 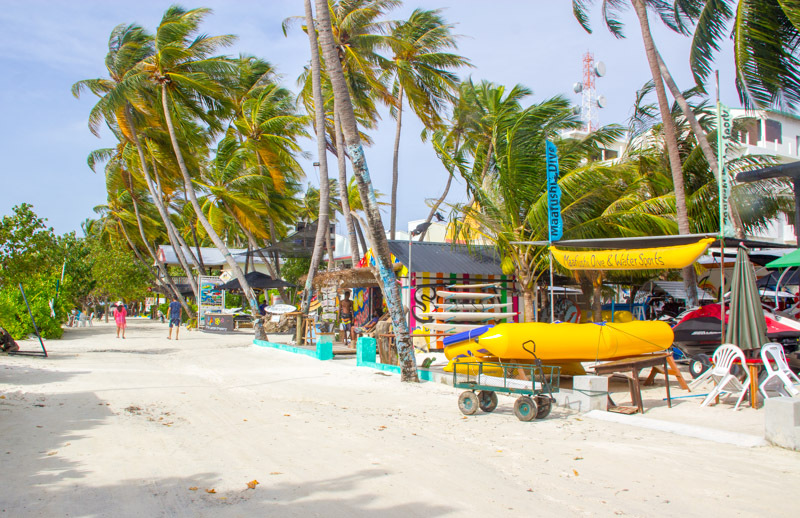 There is a bikini beach at the lagoon where tourists flock to. 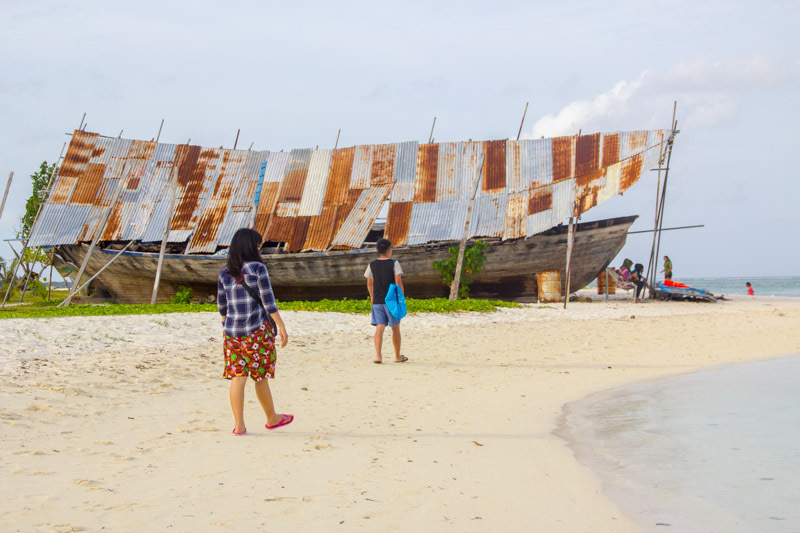 The bikini beach is not really hidden from the locals, it is more like a public beach. The water is not as clear as the water in Hangnaameedhoo, we didn’t bother to swim. 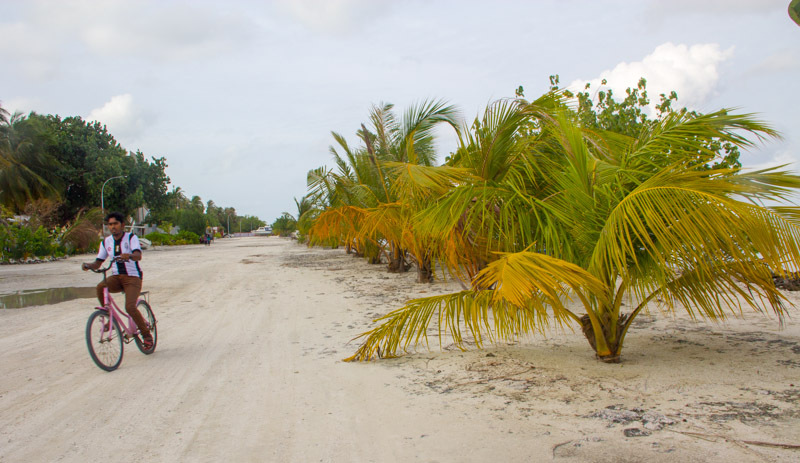 Similar to Hangnaameedhoo, the ground of Maafushi island is compacted sand that is uneven. After the rain, flood is inevitable in certain areas. At night, certain areas are not well-lit. But since it’s a lively island, we really felt safe. There are plenty of convenient stores, where we could buy drinks, snacks and daily life necessities. 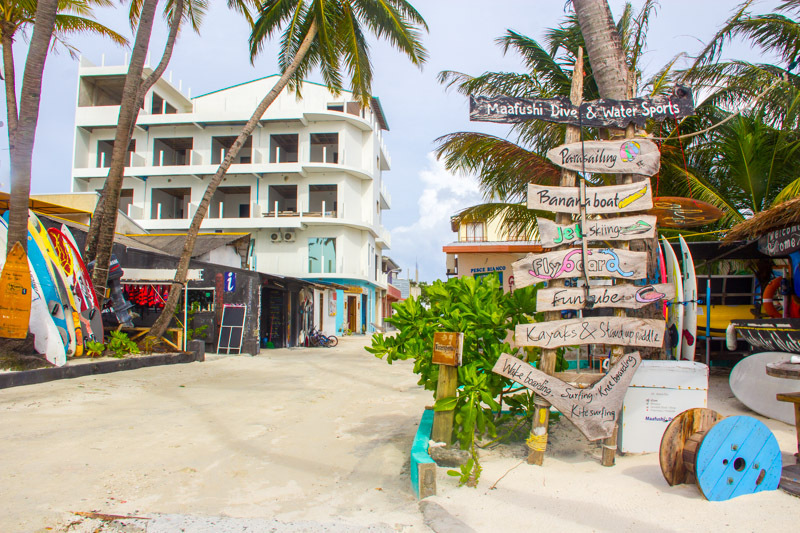 Since it’s a “tourist hub” Maafushi has plenty of dining options. We tried 3 of them, and here are what we think. 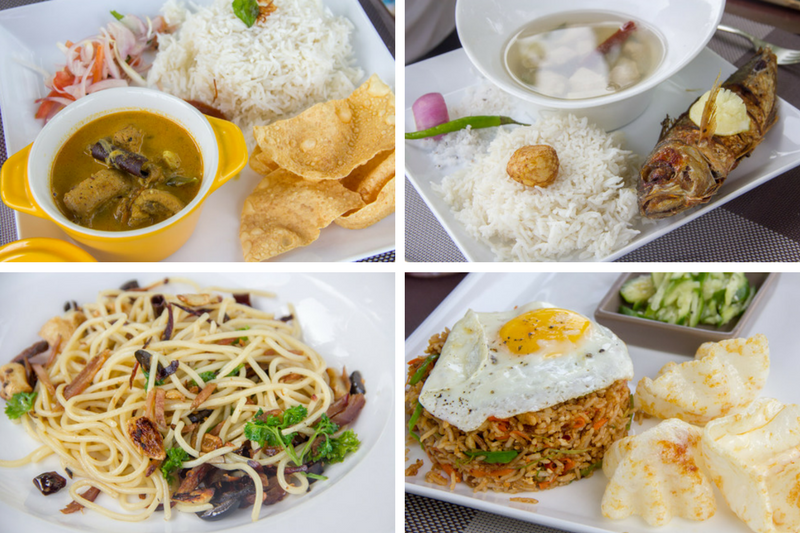 Located at Velana Beach Hotel, Kalaama Restaurant is just 2 mins walk from Maafushi Inn. The food is nice with awesome presentation. However, we were turned off by the staff who promised to give us mosquito repellent but never did. There were ants crawling on our table and a cat begging to be fed when we were eating. We spent USD 58 for 4 dishes and 3 drinks, it’s neither cheap nor too expensive. Located at Arena Beach Hotel, this restaurant is always crowded for lunch and dinner. During lunch time, they have lunch set menus; meanwhile, at night, they serve buffet. 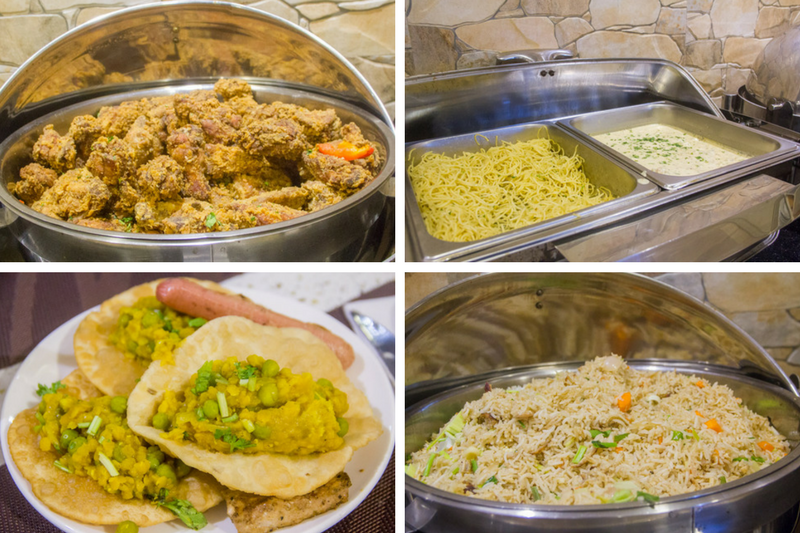 We went there for dinner buffet, it cost USD 12 before tax (after tax, it’s USD 15) excluding drinks and ice creams. The food was decent. The BBQ was great though limited in variety. On the day that we went, they served fried rice, pasta, fried chicken, grilled sausages, grilled meats, deep fried fish nuggets, vegetables and cakes. 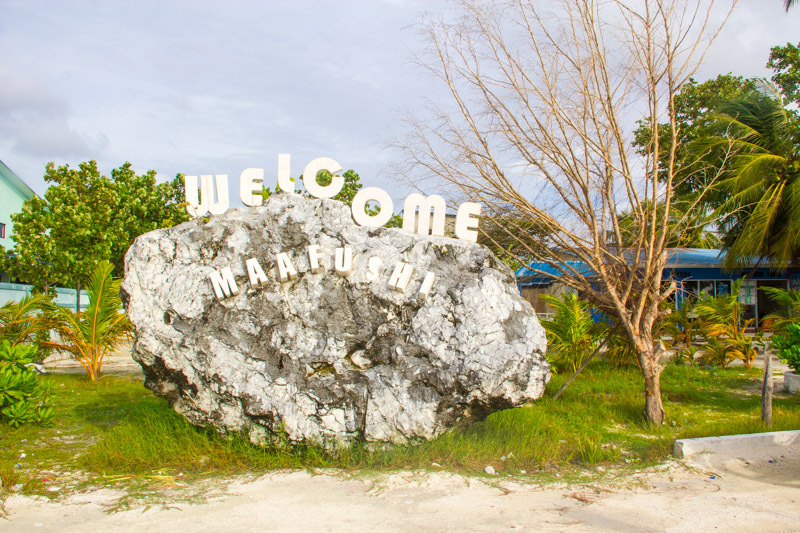 I’d recommend this restaurant to anyone visiting Maafushi island. Located at Stingray Beach Inn, the restaurant ranks quite high on TripAdvisor so we gave it a try. 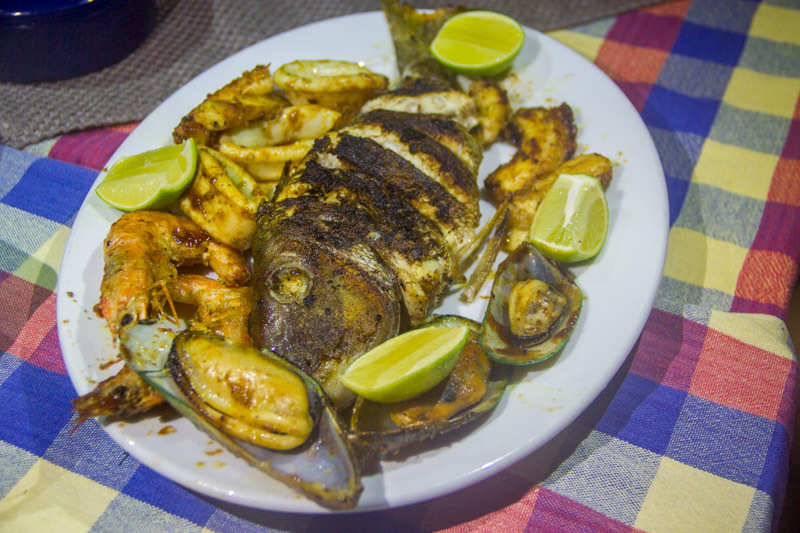 We ordered a massive mix grill which consisted of grilled fish, calamari, prawn, and mussels. It cost MVR 220 and it was pretty good. However, the staff was horrible. He told us we could only order once, because, otherwise, it would be inconvenient for them. We didn’t know the dishes come with a plate of rice, so we ordered a few plates of rice. He just kept quiet, and he delivered too much rice than we could handle. If you want to try this restaurant, lower your expectation of the service and you’ll be fine. After spending the first 4 days in Hulhumalé and Hangnaameedhoo, honestly, I think Maafushi is heaven! There are so many options of activities and dining. The beach and water are not too fantastic, though; you’ll be better off swimming at resort islands. 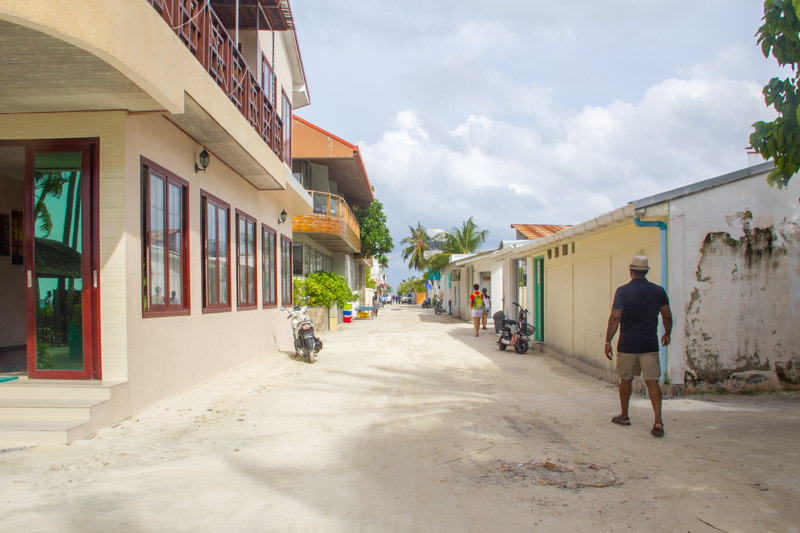 If you’re visiting Maldives, I really recommend that you spend at least 2 nights in Maafushi. 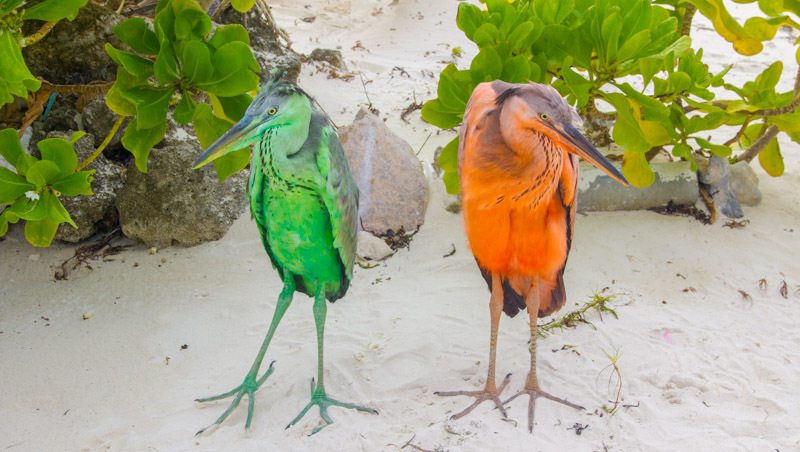 Hi, I’m loving your posts on the local islands! I am planning a week in the Maldives in January with my husband and teen daughter. 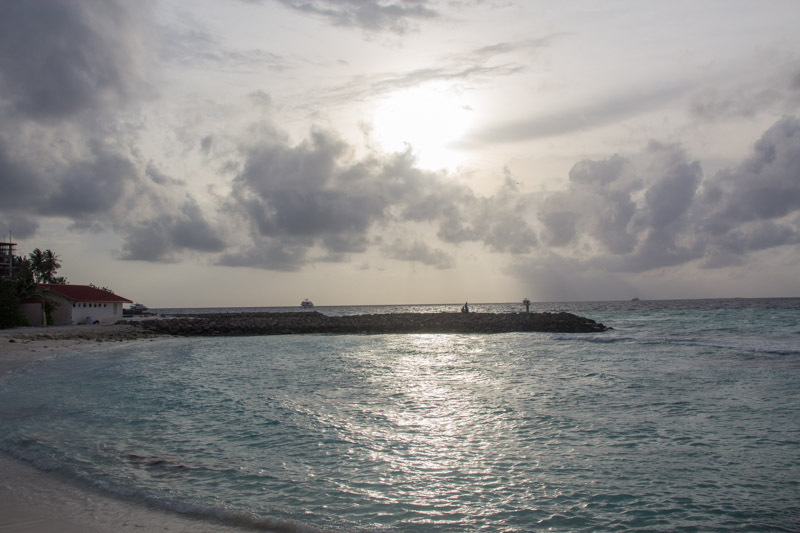 I’d like to stay on two islands and I’m thinking Maafushi for sure, and then either Fulidhoo or Hangnaameedhoo. I understand Maafushi doesn’t really have a house reef, so we are hoping for some great beach snorkeling from the other islands. What would you recommend and how would you divide your time? Thanks so much! Judging from what people are posting on Youtube about snorkelling in Fulidhoo, I have a hunch that Fulidhoo has better house reef than Hangnaameedhoo, but I could be wrong! 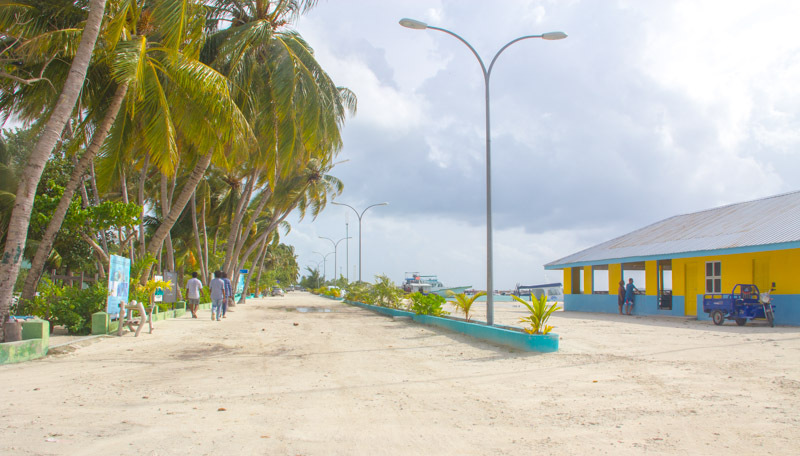 If you’re a city kind of people, I think you can do 4 nights Maafushi and 3 nights Fulidhoo/Hangnaameedhoo. But take note of the ferry schedule. The ferry schedule for Hangnaameedhoo may require you to stay in Male for the first and last night. For me, I stayed the first and last night in Hulhumale, 3 nights in Hangnaameedhoo and 2 nights in Maafushi.